In the first article of this 3 part series all about a unique way to solo on your acoustic guitar, I showed you a very different way to approach using the pentatonic scale for creating awesome (sounding) fingerpicking solo riffs on your guitar. Be sure to check this article out first so you understand what it is I will be covering in today’s lesson. Speaking of which, in part 2, we are going to extend on this solo approach by applying it in a blues context, to a very common pattern on the guitar sometimes referred to as the horizontal pentatonic scale shape, simply because it moves in this direction across the fretboard. I am going to show you how you can apply the open string solo technique from article 1 to this pattern to create awesome and unique sounding fingerpicking blues guitar solo’s. I’ll also run you through some actual blues riffs derived from this pattern and our unique fingerpicking solo approach using open strings, so you can start building your acoustic blues guitar soloing repertoire. As I explained in the first article, keys that have a lot of open string notes in them are best suited for this way of playing, as we are specifically targeting open strings throughout this soloing approach. As you can see, the key of Am also has all the open string notes within it. It is referred to by various names, but is simply a combination of pentatonic scale patterns 5, 1, and 2. Having said that, it is also a scale pattern within itself, and you can treat it like that if you don’t have much experience with pentatonic scales at this time. What we will do with this pattern now, is apply the open string acoustic guitar solo technique that was outlined in the first article in this series. What a great and unique sound the open strings bring to this otherwise typical pattern for soloing on your guitar. Now it’s time to create some blues riffs utilising the open strings from this pattern. The following are 3 examples of blues riffs I have created from the open string scale pattern above. Learn each riff, and then take the riff and apply it over a backing track. I demonstrate not so much these exact riffs, but soloing with the scale pattern in general, over a blues in A backing track in the video that accompanies this article, so be sure to watch that too. This first riff targets the upper part of the scale pattern, and finishes within pattern 1 (the middle part of the scale). Notice the subtle hint of connecting this way of soloing on your guitar, with regular soloing with the 1/4 bend at the 5th fret, 3rd string. 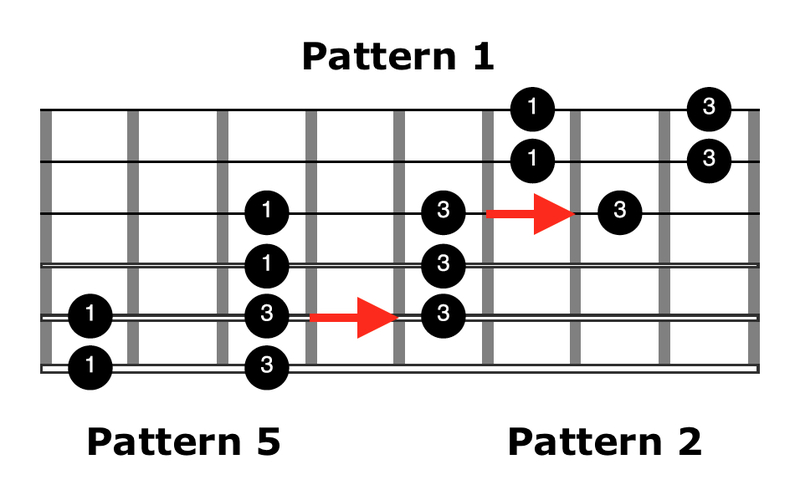 This second riff also targets the upper and middle parts of our scale pattern. Notice the use of the blues note at the 8th fret on the 3rd string. This final riff targets the lower part of the scale with a sequence, that in part repeats as it moves into the middle area of the shape (pattern 1 territory).